We Refinished the Floor at Perkins! Our main event venue is Perkins Lodge. 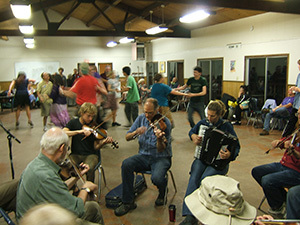 Campers enjoy Perkins Lodge as the focal point for many activities, including our late-night after-dance party. There's a strong feeling of community centered around the crafts, games, music, food, all happening at the same time with everyone all together in the same place for the late-night partying. Unfortunately, in 2012 the floor was not up to our standards for dancing. It was rough and sticky, kind of like dancing on cement or on grass. Makes it hard to dance smoothly. Twirling was almost completely out of the question. But it worked for the after-dance parties. Having everyone in the same room is a Very Big Plus. At the 2012 camp, AmWeek Managers Eric Black and Diane Zingale promised that we would donate materials and labor to the camp to refinish the floor and make it more suitable for dancing, and to have that done for camp in 2013. 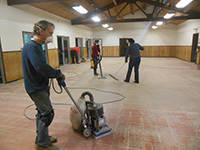 With the support of the Jones Gulch YMCA Camp, we put together a work crew led by Marty Brenneis, and over a 2-day period the crew of 10 volunteers sanded, countersunk nails, replaced crumbling sections, and cleaned the floor. Then we applied a total of 8 coats of durable modern sealer and finish which is designed to stand up to muddy boots during the winter and still have a smooth surface for dancing. The floor is still the same funky particle-board tile, so it's not beautiful to look at. But our refinishing makes the surface nice and smooth, and it's better for dancing than many of the floors in "regular" dance halls used for contradancing all around the country. We've learned that a year of muddy boots of other campers at the YMCA camp is really hard on the floor finish, and we have to refinish each year for our camp. 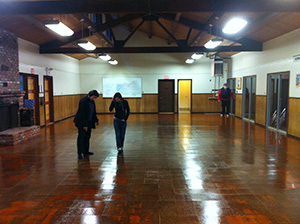 We'll be doing it again for the beginning of camp, so we'll have a nice fresh floor for this summer’s AmWeek camp! Check it out this summer!